In the introduction of The Best Japanese Science Fiction Stories, editor John Apostolou informs the reader that, prior to the publication of this collection, it was very difficult to find Japanese science fiction in English translation. Translations of a few Abe Kōbō novels (such as The Ark Sakura and Inter Ice Age 4) had been published by Knopf, but the majority of translations of science fiction stories (such Arai Motoko’s A Ship to the Stars and Takachiho Haruka’s The Adventures of Dirty Pair) were only available from the Kodansha English Library, which was (and still is) virtually impossible to find outside of Japan. 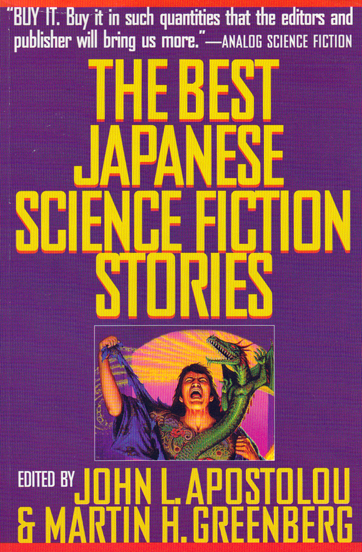 The purpose of The Best Japanese Science Fiction Stories, then, was to collect translations of short stories by major Japanese sci-fi authors such as Hoshi Shinichi, Hanmura Ryō, and Komatsu Sakyō. Most of the thirteen stories in this collection are less than ten pages long. Some (like Abe Kōbō’s “The Flood” and Komatsu Sakyō’s “The Savage Mouth”) read like modern parables of the nastier aspects of human nature, while some (like Hanmura Ryō’s “Tansu” and Kōno Tensei’s “Triceratops”) are more dark fantasy than science fiction. Others, however, are examples of speculative fiction at its best. One of my favorite stories in the collection is Tsutsui Yasutaka’s “Standing Woman,” which is a window into a dystopian future in which anyone caught grumbling about the wrong thing – whether it’s high prices at the supermarket or too much overtime at work – is punished by being “vegetized” and planted next to a sidewalk or park bench. The story that closes the collection, Yano Tetsu’s “The Legend of the Paper Spaceship,” comes as close as a twenty-page short story can get to being a masterpiece of science fiction. It features a mysterious woman, a psychic son, an isolated village in the country, and strange legends that all come together to suggest secrets and cosmic mythologies that are illuminated just enough to capture the reader’s imagination. Although the translation is a bit wonky in places (particularly in Kita Morio’s “The Empty Field”), I really enjoyed reading all of the stories in The Best Japanese Science Fiction Stories, and the foreword and introduction provided interesting glimpses into the process of how these stories were translated. If I am allowed one complaint, however, it would be that there are no female writers represented by this collection. I would recommend that anyone looking for an overview of the many female sci-fi writers in Japan should check out Kotani Mari’s essay “Alien Spaces and Alien Bodies in Japanese Women’s Science Fiction” in the essay collection Robot Ghosts and Wired Dreams. (If you can read Japanese, Kotani’s monograph Technogynesis is also fun and informative.) In any case, The Best Japanese Science Fiction Stories served its purpose by making me want to read more Japanese science fiction short stories, and from here I’m planning on moving on to Speculative Japan and Speculative Japan 2. Ooh, this sounds cool, adding it to my list! I’m excited to see someone else making their way through what Japanese SF is available. I may chime in at random as I make my way through your archive, so advance apologies for dredging up posts of the long past. Triceratops might have been my favorite out of this collection, but mostly I was surprised to find The Hole – which I had read in many a New Horizons textbook to my young students in Kyoto.